The Cultural Fit Factor informs HR professionals and other business leaders that when and if an organization has carefully evaluated its belief systems and ensured that employees believe in the same principles and values, it can focus its energy and activity in powerful ways to achieve organizational goals. This must be articulated in clear, consistent terms. The organization must live its values. Employees, potential employers, customers, and vendors know if you mean it — their instincts and intuition tell them instantly if you mean what you say, and your actions show it. If your organization is unclear about its values, or not living them, an incongruence in your employer branding emerges, which undermines your recruitment and retention efforts. You may attract qualified candidates, but qualified candidates that don't mesh with your organization culture tend not to stay long. The Cultural Fit Factor demonstrates how companies with high employee value propositions attract talented, capable employees that fit into their organizations and how they politely but firmly repel those that don't. Provides a critical discussion on how to increase the ROI of recruitment and retention. Discusses the influence of sustainability on branding--especially to the younger talent pool. Explores the impact of mergers and acquisitions on organizational culture. Includes a practical employment branding tool kit. Chapter 2. So What Is Organizational Culture? About the Author: Lizz Pellet is the CEO of EMERGE International (www.emergeinternational.com), a California-based consultancy firm dedicated to improving the ROI of organizational culture, employment branding, and transformational change efforts. She is also a Fellow from Johns Hopkins University. She is the author of Getting Your Shift Together: Making Sense of Organizational Culture and Change: Introducing Cultural Due Diligence. Lizz is a member of the National Speakers Association and has presented more than 70 professional learning sessions in the past few years. 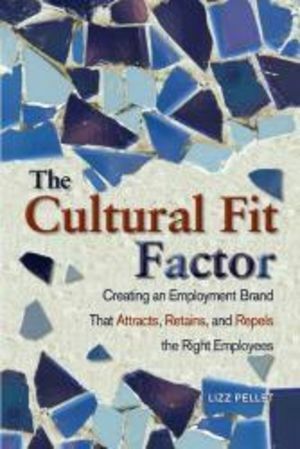 "In her book The Cultural Fit Factor, Lizz Pellet reveals how to use employment branding to convey the real culture of your organization and find people who really fit! This is the ultimate guide to finding the right fit for any professional experience!" -- Marshall Goldsmith is the New York Times bestselling author of Succession: Are You Ready? and What Got You Here Won't Get You There - a WSJ #1 business book and Harold Longman Award winner for Business Book of the Year.